Aluratek Portable Battery Charger - Power bank - 10000 mAh - 2 A - 2 output connectors (USB)Aluratek's 10,000 mAh Portable Battery Charger utilizes advanced lithium-ion rechargeable battery technology offering a robust power capacity with one 5V/1A and one 5V/2.0A output. Small enough to fit in your pocket, this lightweight and portable battery charger is perfect for on-the-go charging when you don't have the convenience of an AC outlet nearby. With dual USB ports, you can charge two devices simultaneously including smartphones, tablets and other USB powered devices. Includes LED charge status indicators so know how much battery power is remaining. Aluratek's 10,000 mAh Portable Battery Charger utilizes advanced lithium-ion rechargeable battery technology offering a robust power capacity with one 5V/1A and one 5V/2.0A output. 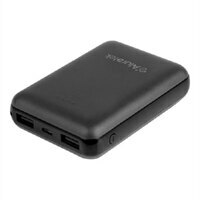 Small enough to fit in your pocket, this lightweight and portable battery charger is perfect for on-the-go charging when you don't have the convenience of an AC outlet nearby. With dual USB ports, you can charge two devices simultaneously including smartphones, tablets and other USB powered devices. Includes LED charge status indicators so know how much battery power is remaining.